Alpha males Robert De Niro and Jay-Z's squabbling almost ruined Leonardo DiCaprio's birthday party for everyone. 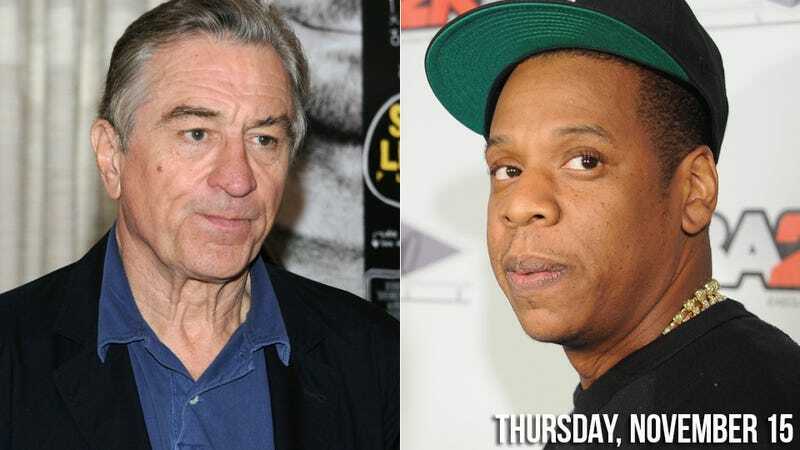 De Niro let Hova have it for mentioning that he'd be willing to record a song for the Tribeca Film Festival and then failing to return any of De Niro's calls to follow through. Jay-Z tried to joke about it and Beyoncé glided over to try to keep the peace, but De Niro said that there were no excuses and although he considers Jay-Z "the man," it was "JUST RUDE." At last, DiCaprio cried in the dulcet tones of an angelic child: "I don't like it when Mommy and Daddy fight!" And everyone hugged, and that's the story of Christmas. This is a rather grody trailer for an hour-long video made by Lady Gaga and Terry Richardson.